DUB PISTOLS have been adding their rock ’n’ roll swagger to the UK’s dance scene for 20 years, but it’s a relatively recent phenomenon that’s seen them become a fully-fledged live band. The outfit started life in 1996, formed by frontman Barry Ashworth, and their first two singles There’s Gonna Be A Riot and Best Got Better gained them a reputation for a genre-defying sound from the start. 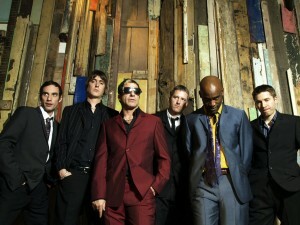 As well as their own music, Dub Pistols have remixed the likes of Crystal Method, Limp Bizkit, Moby, Bono, Korn and Ian Brown, and work on film and video game soundtracks. Guest vocalists have included the tones of Rodney P; Specials frontman, Terry Hall; rap wünderkid TK; Sugardaddy horn-blower Tim Hutton; and scratch maestro DJ Stix. Their latest album, Return Of The Pistoleros, has received rave revues since its relase and the group are on the road again, arriving at the Boileroom in Guildford on Saturday (19 March). Other future gigs at the Boileroom include The Carnabys on Tuesday (22 March), Rats On Rafts on Wednesday (23 March), Blossoms on Thursday (24 March), and Yndi Halda (25 March).